A Manicure With Ground-Up Weed? Yup. Three-dimensional nail art. Flip manicures. Duck feet (yes, duck feet). Manicurists are getting outrageously creative with nail art designs nowadays. But there’s one emerging trend in nail art you’ve probably never seen before: cannabis-infused designs. Customers are starting to bring bud to their nail technician so they can stylishly infuse the greenery into an acrylic or gel manicure in lieu of the gold flakes and glitter we’re used to seeing. The canna-mani, or “weedicure,” gets its name from the incorporation of ground cannabis flower in your nail design. This new trend in nail art is popping up everywhere, although it originated in California. As someone who loves to stay up to date with the latest trends in beauty and fashion, I was naturally intrigued by these cannabis nail designs I saw online and wanted to see for myself how the process worked. Researching the top nail art salons in Seattle led me to Sènsé Nail Spa, voted best manicure and pedicure in Western Washington. 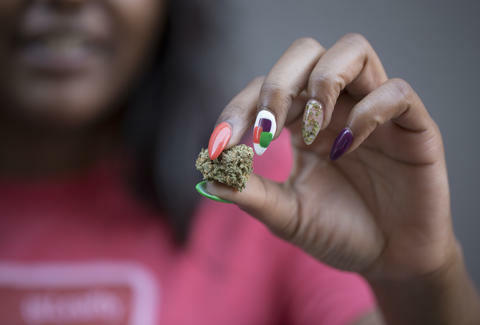 The spa said they would be up for the challenge, so with Rebecca, Leafly’s senior editor, and Julia, our photo editor, in tow, I embarked on a journey to glam up my nails with some ground-up bud. We arrived at noon for my appointment and checked in. While I waited, I picked out the colors I wanted for my manicure. After Julia and Rebecca helped me decide on the perfect polishes, my nail technician Daniella emerged, excited and ready to get started on what would be both Leafly and Sènsé’s first experience with cannabis nail art. I took a seat at Daniella’s station, where she immediately got to buffing and filing away at my nails. To add length to my natural nails and achieve the look I wanted, Daniella recommended I get a liquid hard gel full set. Ladies usually opt for a full set for aesthetic reasons, or to extend the length of their natural nails. Daniella then cut my nails to the desired length and filed them into an almond shape. Next, she applied a nail primer before applying the liquid hard gel. With the gentlest touch, Daniella gracefully placed her brush in the gel, twirling it around before completely drizzling it over my nail. After I set both hands under the LED light to cure the gel on my nails, Rebecca ground up a bud of Blueberry Cheesecake, leftover from the deliciously infused blueberry cheesecake she made a few weeks back. 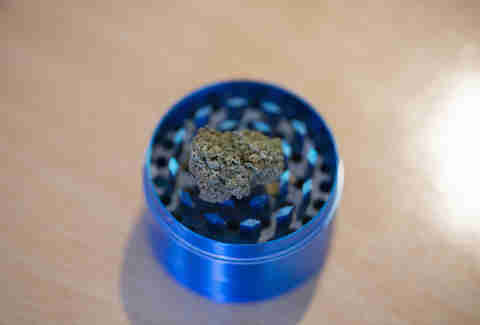 Once the bud was broken down, Daniella picked up flecks of cannabis and placed them directly onto the nail of my ring finger. Next, she brushed more gel over the ground flower to keep it in place. After my canna-nails were cured under an LED light, Daniella got to work painting the rest of my nails. With Hempfest, Seattle’s annual cannabis legalization festival, taking place that weekend, I couldn’t help but show my Leafly pride by choosing our signature strain colors. Daniella even painted our tile logo onto a nail on each hand. Overall, the process took a whopping two and a half hours, but we were slowed down a bit by a slew of amusingly stupid questions from Rebecca and Julia and the occasional employee rubbernecking, as they had never seen a cannabis-infused nail design before. Although I did go a little more colorful than usual with my nails, I really enjoyed the end result and thought the cannabis added a subtle but unique touch going into the Hempfest weekend. Whether you’re looking for a head-turning nail design to try on your next visit to the spa or have been searching for a new way to incorporate your love of cannabis into your personal style, a canna-mani is a fun option that will definitely spark some conversations. Would you be willing to try one? This article was originally published as Exploring the Canna-Mani: A Cannabis Nail Design Picture Gallery. For this and more articles on cannabis news and culture, visit Leafly News.